This tape recording is a message from Geshe Kelsang Gyatso delivered to Lama Thubten Yeshe on July 22, 1983 by Chip Rodarmor and Geshe Kelsang’s translator. At enormous expense Geshe Kelsang sent Chip and Tenzin all the way from England to California especially to represent Geshe Kelsang by delivering his blackmail. We hope that these facts are clearly apparent to you. Dear Lama Yeshe, thank you very much for your gifts to us which Tenzin and I both deeply appreciated. We were deeply disappointed at not being able to see you. We feel that we were unable to accomplish one of the most important purposes of our visit to you, which was to explain the urgency and serious dangers in the present situation. We meant to protect you and to protect the FPMT from very serious legal dangers, which would be extremely damaging to your reputation and of FPMT internationally. We do not feel, therefore, that your taped response to our first meeting is acceptable under the circumstances and, therefore, urge you to consider very carefully this taped communication. Please know that we are sincerely and faithfully trying to protect you from these dangers but that you are ignoring us. Please do not ignore us now. The situation at present is that present trustees of the Manjushri Institute, including Peter Kedge and Harvey Horrocks, are involved in irregularities with respect to and violations of the terms of the Manjushri Institute Trust Deed. These constitute civil illegalities and please appreciate that some of these are major. They are very important – and that some of these are viewed by the Charities Commission as extremely serious and could constitute a basis for the removal of three of the four trustees of the Manjushri Institute, including Peter Kedge, Harvey Horrocks and yourself, Lama. Please also appreciate that the situation, that the present situation, especially with respect to the trustees of the institute, also involve criminal illegalities. Many of these are very serious violations of the law with respect to the conduct of business operations, particularly Lotus Trading Company. Some of these illegalities are extremely serious criminal actions carried out by the trustees themselves and others very closely connected with FPMT. Tenzin and I are not in a position to say what these illegalities are. But if you wish to know the details, and if you wish to know the people involved we urge you to call Peter Kedge or Harvey Horrocks and ask them because they know and its very possible that Jacie Keeley knows as well. Who is involved in the criminal illegalities? Basically, they are key members of FPMT, of the FPMT organisation. Now at present, the Charities Commission holds a type-written report numbering close to 100 pages which not only summarise a number of civil and criminal illegalities with respect to the conduct of the management of Manjushri Institute but also contains supporting evidence. Please also appreciate that our attorney in London, who is an expert in Charity Law, also holds details of the most serious criminal illegalities conducted by some of the trustees and others and supporting evidence. Now, the immediate consequence of not signing the agreement that we presented to you a few days ago is that our attorney in London will turn over the details of the most serious criminal illegalities to the Solicitor General’s Office. 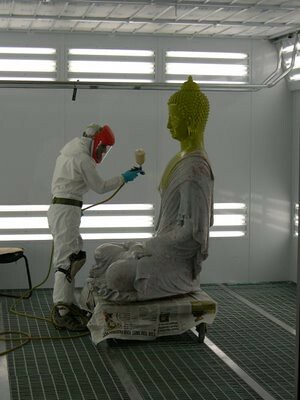 The consequence of this will be a police investigation of the trustees of the Manjushri Institute in addition to the conduct of the FPMT organisation. In addition to this the Charities Commission will start a full investigation of the civil and criminal illegalities contained in the report which I mentioned – which the Charities Commission already has and has examined over the last few weeks, but at our request, is not investigating yet. This report explicitly requests the Charities Commission to remove three trustees from the Manjushri Institute, including Peter Kedge, Harvey Horrocks and you, Lama. And the details given are the illegalities, which I have already mentioned. Lama, please also appreciate the overall consequence of these actions proceeding in the court and also in the Charities Commission. Please realise that there probably will be a public trial of trustees of the Manjushri Institute in addition to other key FPMT people. Please also appreciate that you, Lama, will probably have to go to court to answer questions and possibly even to stand trial. If prosecuted, trustees of the Manjushri Institute will probably go to jail and possibly also other members of the FPMT. And finally, the Charities Commission, through its own investigation, and as a result of the public trial, and possible prosecution of trustees and other FPMT will formally remove the 3 trustees I have mentioned from the Manjushri Institute. Now please appreciate that the FPMT, as a result of this, will be disgraced internationally. The purpose of Tenzin and my coming from England to see you in California was to impress upon you the grave seriousness of the present situation and to obtain your signature on the agreement we presented to you along with the letter from the Institute. This action we have taken has been at the recommendation of the Charities Commission and also of our own attorney in England. As you said in your tape that you agree with the proposal that we have offered you, then please sign the agreement now to take back to England with us on Monday. If we are unable to return to England with your signature on that agreement, which you have already indicated you agreed with, then please know, Lama, without doubt that civil and legal actions will commence next week. Lama, I will call you at 10:30 tomorrow morning to hear your response to this communication. I sincerely hope from the very bottom of my heart that you will be willing to sign the agreement, which represents an extremely tolerant, and an extremely peaceful solution to this overall problem under the circumstances. However, if there are further questions that you wish to ask – if there is any way in which Tenzin or myself can be of further assistance to you in understanding the present situation please let us know and we are completely at you disposal from now until the time that we actually have to leave for England, which is Monday afternoon. Please listen to my tape carefully so that you do understand completely what is involved and that there will be no regret in the future if legal actions are, in fact, taken. Good night, Lama. Funny how the people who were doing the dodgy dealing were residents at Manjushri and therefore disciples of Kelsang Gyatso. That Rodarmor ( a reall slimeball if you hear his voice) should twist this to steal Manjushri from Lama Yeshe as they did is an indication of the cynical manipulation of circumstance that is the NKTs nature. They even produced a video to tell ‘their side’ Funnily it doesnt make any mentio of all this blackmail. Where is Chip now, I wonder? In retreat or in hell? Does anybody inform me what Tharchin name was before he got ordained ? TP, why don’t you tell the truth? The ‘Priory Group’ were trying to prevent Manjushri Institute from being sold by the FPMT to raise funds for their global expansion – there was no blackmail involved because, if the priory group had not acted, Manjushri Institute was doomed anyway, against the wishes of the students. FPMT were also raising funds in other ways, including drug smuggling. Lama Yeshe was aware of this but I doubt he was the instigator. I doubt you would let me post a direct link that tells the truth about this issue, so if you want to full story, google ‘manjushri institute stolen’. At some point between 1985-87 the Tushita centre, Delhi, was visited by the police in connection with the sale of electrical goods – tapedecks etc. This was a big story at the time in Inji buddhist circles – one version, from a good friend of mine who lived in Delhi, was that certain other contraband was being traded. Have no idea whether my friend was correct but offer it as others are making comparable allegations. At that time, India was vigilantly trying to protect its domestic consumer electronics industry. If one brought a tape deck, or what was called a ‘2 in 1’ into the country, it was written in your passport. Nowadays India is awash with cheap Chinese consumer goods, like everywhere else. A forthcoming book (Sept. 2018) entitled “Battling the Buddha of Love: A Cultural Biography of the Greatest Statue Never Built,” by Jessica Marie Falcone (Cornell University Press) will shed more light on the more serious financial mismanagement by FPMT. Millions of dollars were raised from relics tours and yet only a very small model Maitreya statue was ever built. @Brian, i’m glad they only built a small Maitreya. The original proposal for a ginormous Maitreya at Bodh Gaya could have impacted on the water table and didn’t consider how the local villagers would be affected. It was a vanity project. Indeed, we were spared the kitschy and grandiose FMPT monstrosity. Meanwhile, NKT’s Manjusri idol studio has been busily producing misproportioned and tacky plastic “sacred” sculpture for export: the environmental cost of plastics to marine and terrestrial lifeforms is increasingly a manmade disaster we are becoming aware of. The project aimed to generate income, was embedded in a social project incl school and hospital. Some claimed it failed because of “corruption” (on Indian local side). So what narrative is true? What is more in line with reality? Are there other narratives? Matilda: It is as if the dharma originates and resides the UK for export back to Nepal. Imagine the audacity to conceive of the following thought: “teachings of Kadam Dharma coming close to full circle, rising from their origins and traveling around the world for a thousand years to finally be delivered by a Qualified New Kadampa Teacher in Kathmandu.” This was the sentiment behind yet another statue project in response to the Nepal earthquake of 2015. No, not building housing for children and their families (600,000 structures in Kathmandu and other nearby towns were either damaged or destroyed) or providing some disaster relief and ongoing seed funding…no. Yet another gilded idol for Geshela in his priory and another opportunity to open an NKT “centre” abroad. 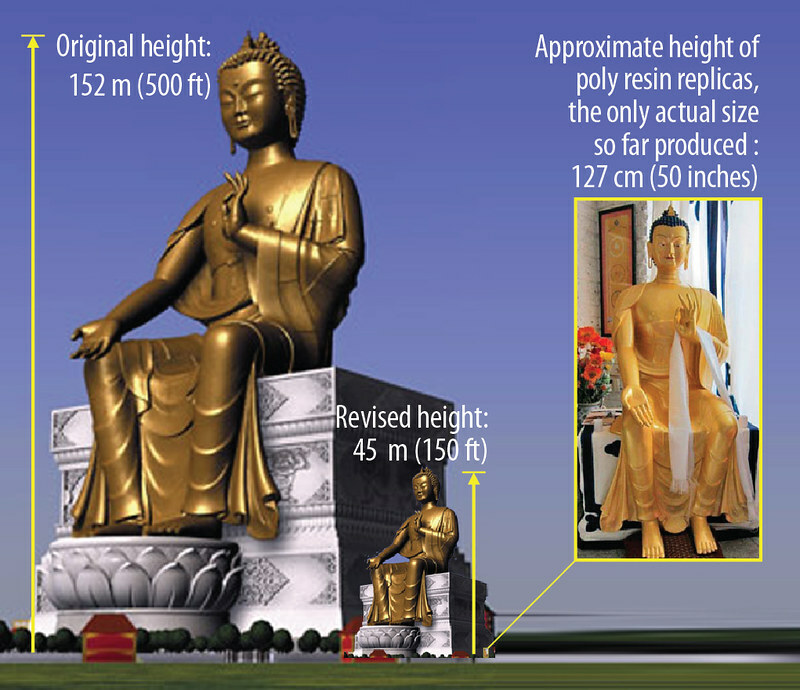 The original proposed statue height was 500 feet. Since it is a sitting (not standing) figure, that would have made it larger than the Statue of Liberty in New York. The original height was scaled down to 150 feet but for over 20 years, the only statue provided for promotional purpose was a modest 50 inches and yes, made of plastic resin, folks, just like the NKT kewpie dolls. There was a larger mockup made more recently. I think really the question is not– is the Maiteya Project on track after 30 years and approximately $30 million spent– but rather where has all the money gone? According to Nicholas Ribush, the statue will be 150ft high. 150 feet = 46 metres. That is 14m taller than the 32m high statue of Maitreya Buddha at Diskit Monastery in Nubra Valley, Ladakh. There has been criticism in the press about some aspects of the Project, including the compulsory acquisition, under “India’s Land Acquisition Act”, by the State Government of 660 acres (2.7 km2) of private land, homes and small farms; which are intended to be leased to the Project, for construction of the statue and related infrastructure, including “landscaped park housing a cathedral, monastery, convent, guesthouse, library and food halls…”. Peter Kedge, Director and CEO of the Maitreya Project has posted a number of replies to these criticisms. Following the 1,262nd day of “peaceful dharna”, in August 2010, by the majority of local farmers against the compulsory acquisition of their farms, the Cabinet Secretary of Uttar Pradesh announced a reconsideration of support for the Project. you give a good impression here how NKT operate. 2. then you deliberately accuse the other person to not tell the truth which implies he would lie. The ten first words of your comment are already a spin of the facts! First of all: this is a document as it is, I didn’t comment it, I didn’t add anything to it. So how can your properly claim I would not tell the truth? Where is the untruth I tell? All the other sentences of your comment I didn’t read nor do I wish to read them. I assume they are in line with the rewriting of history by the NKT and aim to spread a story, where the NKT is the innocent, selfless, faultless hero and others are to be blamed as corrupt or full of faults and the cause of all the problems. Everybody who wishes to understand the story of Manjhushri Institute, I recommend the academic research by David Kay and to apply common sense to put the information he provides and the attitudes of the NKT leadership into perspective. My point is you posted this under the title ‘blackmail tape’, This leads the reader to a particular conclusion, does it not? This is your spin on the meaning of the transcript but you haven’t posted any context as to why this happened in the first place. Because you have posted this out of context, it’s misleading. No doubt your intention is to harm the reputation of the NKT – why else would you have posted this? I suggest that your readers get the full story before jumping to the conclusion you have led them to. as you can see I put “Blackmail Tape” in the heading and the link to that post from the very beginning in apostrophe. The document is just as it is. Obviously Jacqueline Keely, Lama Yeshe’s Administrative Assistant, felt that the close students of Kelsang Gyatso are blackmailing Lama Yeshe. The document is using the terms “blackmail” and “blackmail tape”. This is how they have called it. Seeing these facts, how can you properly claim this would be my spin? I agree this document is only one side of the story. I would like to post also Kelsang Gyatso’s “Eradicating wrong views” a document by NKT defending their point of view. I tried hard to get it from ‘Thubten Gonpo’ but was not successful. In case you have it, please send it to me, I would post it here too. All in all there were two documents circling at that time. This “Eradicating wrong views” by KG and another one by Lama Yeshe. Both parties sent them to the Tibetan Buddhist centres and the Office of HH the Dalai Lama in London. To be fair both should be posted here. Your are welcomed to send one or both documents. As you can see I also recommended Kay’s research in my comment above to understand the conflict in full. He used also both documents and interviewed people from both sides. You assume that I would have a bad intention and that I want to mislead people. This is not so. The reason why I posted this document is because newkadampa.com does not provide it any more so that it was not accessible any more. tell the truth-if the priory group were primarily KGs disciples, and somebody at the priory was selling drugs, then they and KG should have been aware of it-why didnt they do anything? Why did K Gyatso preside over it and do nothing? Lama Yeshe was never at the Priory and KG was there all the time-so who was to blame for the moral decline? The statement below mentions a 100 page document held by the Charity Commission. I have written to the Charity Commission for clarification and their reply was ‘we do not hold a copy of this document or have any record of having received it’. If there is to be any truth about the document or its existence then it is encumbent upon those who claim its existence and the contents to provide proof of their claim. Otherwise, the may be seen to embellished the history of the Manjushri and its subsequent take over. Perhaps there will be clarification from someone who knows and can provide the evidence. Dear John, I am a bit in hurry and I lack time… so I can offer only a short and likely only a superficial answer. The above post is a manuscript of a recording in which Lama Yeshe was “blackmailed” by Chip on behalf of Kelsang Gyatso. Chip claims in the presence of Lama Yeshe that “Now at present, the Charities Commission holds a type-written report numbering close to 100 pages which not only summarise a number of civil and criminal illegalities with respect to the conduct of the management of Manjushri Institute but also contains supporting evidence.” if you found out that such a report does not exist at the Charity Commission this might indicate that Chip lied to Lama Yeshe and just pressured/deceived him to follow Kelsang Gyatso’s wishes; but it could also indicate that the CC didn’t take such a type-written report seriously or threw it away… Actual I don’t know. Otherwise, the may be seen to embellished the history of the Manjushri and its subsequent take over. Should be read as …Otherwise, they may be seen to have embellished the history of the Manjushri Institute and its subsequent take over. All things are possible. However,the Commission state they need to know of any evidence relating to criminal action within a charity. They advise that any evidence would also be a matter for the police. If the document existed then it would be investigated, as it was claimed to contain evidence of criminality. Surely, there would be a record of that. If the contents were found to be not worth investigation, then there would be no case for the FPMT to answer. Either way the ‘blackmail tape’ is evidence enough of an attempt to gain power over the Institute. The NKT Truth site claim Kelsang Gyatso did not steal the institute and use the so called ‘blackmail’document as evidence to support their case. Thank you for contacting CC and to let us know that actual CC does not have any document about this. This sheds some light on this issue. The person who DID reside over the corrupt practices was Kelsang Gyatso-He was the resident teacher and so he presided over the misconduct. So the blackmail tape was based on threates to lama Yeshe to expose negative actions that were taking place at Manjushri WHILE KELSANG GYATSO WAS IN CHARGE! So, either Kelsang DID know abouth then but kept quiet until it served his cult building purposes or he didnt, in which case epithets like the THIRD BUDdHA simply dont pertain. Either way, the only one who really comes out of it looking dodgy is Kelsang-either he’s a manipulative concealer of the truth unless it suits him or hes NOT buddha. Stuck between a rock and a hard place, I guess. Dies that mean then that Kelsang is the Third Buddha. No, it simply means that the straights at the Institute at the time were running to Kelsang every time they need ed to piss and, while asking permission, grassed up (pardon the pun) the hippies there who got on their nerves. I met Kelsang Gyatso a couple of times – before the coup – I thought he was deeply unpleasant. Money and power rules.